Tonight I made some tacos, with some chicken livers in chipotle sauce - an old recipe from (I think) Diana Kennedy's Recipes From The Regional Cooks of Mexico. 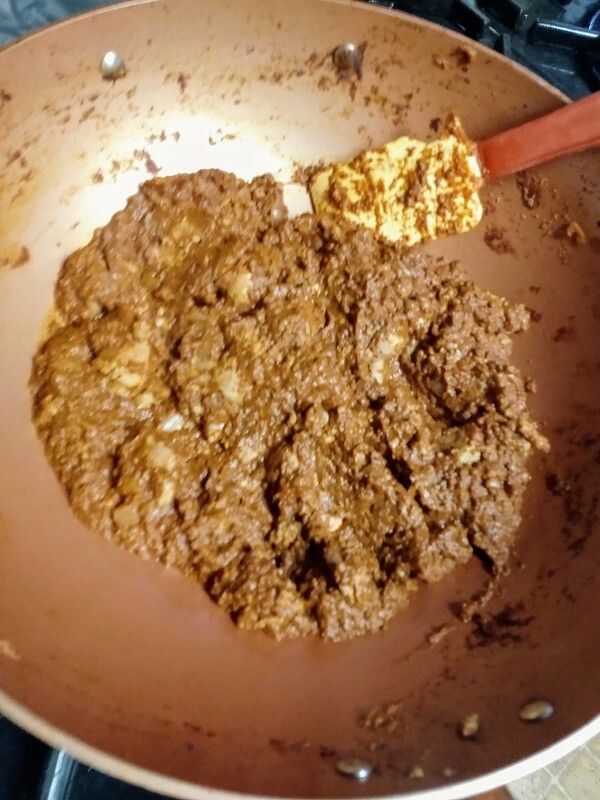 It is one of those that I have made countless times, and have also tweaked it, using dried moritas, and some of that salsa negra from Rick Bayless's Mexican Kitchen. The original recipe had just canned chipotles; still good, but not like the tweaked version. Leftover mix, after the 4 tacos - many more tacos worth left! Also made some guac, with the last two avocados I had - something to eat while preparing the rest. A. Place tomatoes, garlic, and chiles in blender. Blend until smooth. Cut livers in half, then in half again. B. Heat oil over high heat in 10" skillet; add onion and cook briefly, and add livers. Cook 3 min., stirring constantly, then add tomato sauce. Cook about 5 min,. stirring almost constantly, until sauce is reduced and very thick. Add salt to taste, and serve, with fresh corn tortillas. Options: May be made with 10 oz of canned , crushed tomatoes. 1 tb salsa negra may be substituted for the canned chiles. Pork liver, cut into 1/4" thick slices and cut into bite size pieces, may be substituted for the chicken livers. Cover and cook about 20 min (otherwise they will be tough), then uncover and cook down, as in the recipe. I've also tried a few other things in this sauce through the years, mostly things I found in the Asian market, not the Mexican. Pork spleen (much milder than the livers) and pork brains (definitely good, but had to be cooked separately) are two that come to mind. The pork liver was the strongest tasting, and a favorite of a few friends. I love chicken livers so I would definitely try that, as long as it's not spicy. I don't mind a little heat, but I'm a wimp when it comes to spicy foods. 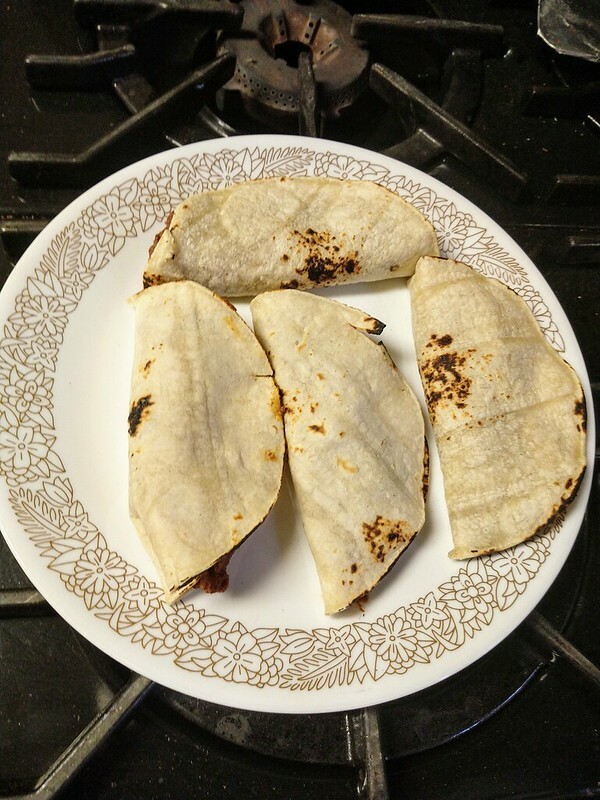 The original recipe only had 2 canned chipotles, which had good flavor, but not much heat. I added one, plus the morita, so you might want to go back to the original! lol And this time I doubled the recipe, and only used 1 canned (that's all that was left in the jar! ), 4 moritas, and a tb of that salsa negra, which is made from ground up moritas, so this batch was HOT! That would make a nice pate as well. Ever since I can remember, I've disliked spicy food. So I guess you could say I've always had an aversion to it. I just don't like the 'heat' being the only thing I taste. I want to taste what I'm eating and I can't do that if it's too spicy. For some people, spice makes the food better. For me, it ruins it. Canned chipotles vary greatly in heat. Years ago, I tested all of the brands of chipotles I could get, and San Marcos - the one with bright blue on the label - was the mildest, but with good flavor. La Morena was pretty hot, and flavorful, so that's the one I got for years after Herdez - the hottest and most flavorful - was no longer available, at least in the local markets (Amazon has it, for a high price). The brand at the Aldi's by me - Pueblo Lindo, I think - is quite hot, and flavorful, and only 99¢/can, so that's what I use now, though you might want to try the San Marcos. I used to keep some of that on hand for a lady I knew that could not eat the really hot things I made, but still had to try them when she would come in unexpectedly, and I had something cooking, or cooked, that she could not resist the smell of! Most would be too hot for her, when she tried them, but it would often be a challenge for me to make the dish with little heat, but just as much flavor. A recipe with just cayenne pepper as the heat, you just leave that out, but when the chili peppers are a major flavor component, you have to find a similar, but milder flavor - like that Aji Dulce pepper, which has an intense habanero flavor, but almost no heat! Oddly, I love the flavor of jalapeno, but not the heat of it. I love jalapeno poppers, especially, but they're not hot because the seeds (and probably most of the membrane) have been removed. Never had canned chipotles, as I don't really like chipotle flavor. I love canned whole green chilies, but those aren't spicy at all. Every Sunday night my husband and myself while watching our favorite TV shows would eat baked Italian sausages. I used to buy the hot sausages at just one store in particular. Some of them had more red ground pepper in them than pork. Those were the ones I always selected. Our Special Sunday treat that I knew the kids wouldn't ask for a bite. Today, absolutely no highly seasoned foods for me.